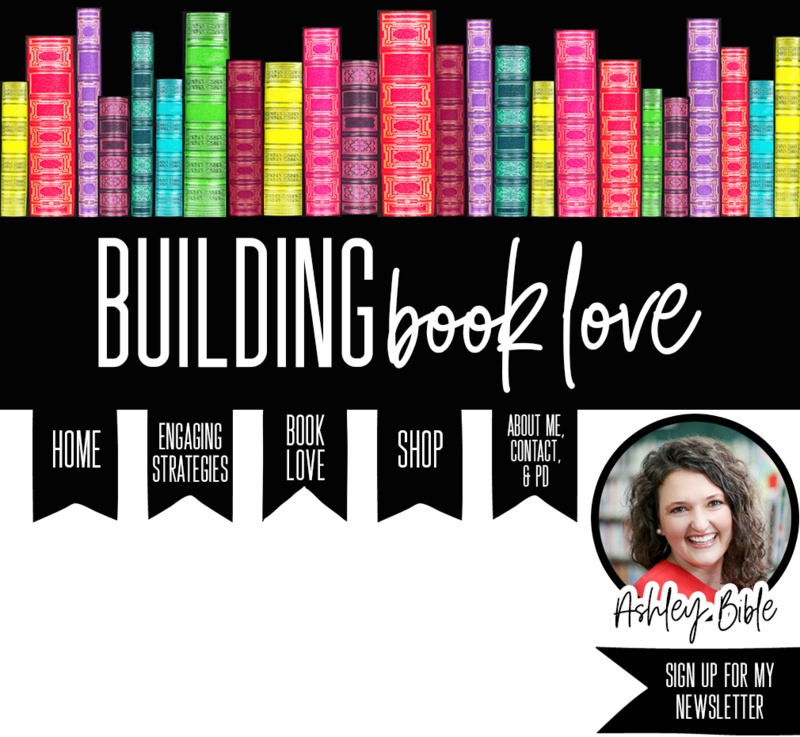 Last New Year I made it a goal to blog about my teaching ideas at least once a month, but I slipped big time this summer. 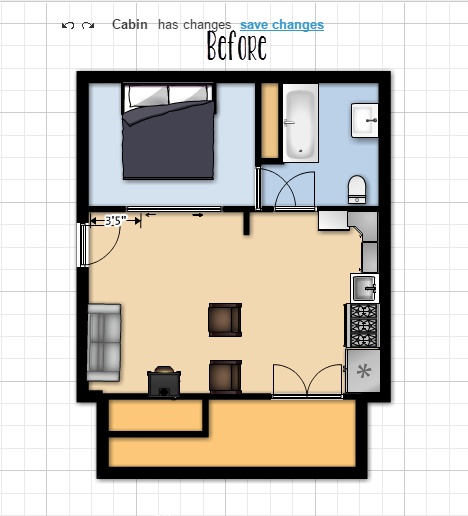 My brain can only produce so much creativity, and this summer I spent it all on remodeling our new home-- a little cabin in the woods. The Transcendentalists is probably my favorite American Literature time period and every time I taught Thoreau, Emerson and the modern tie-in Into the Wild, I would get more and more convicted about the "Simplicity, Simplicity, Simplicity!" lifestyle that Thoreau so adamantly evangelizes. 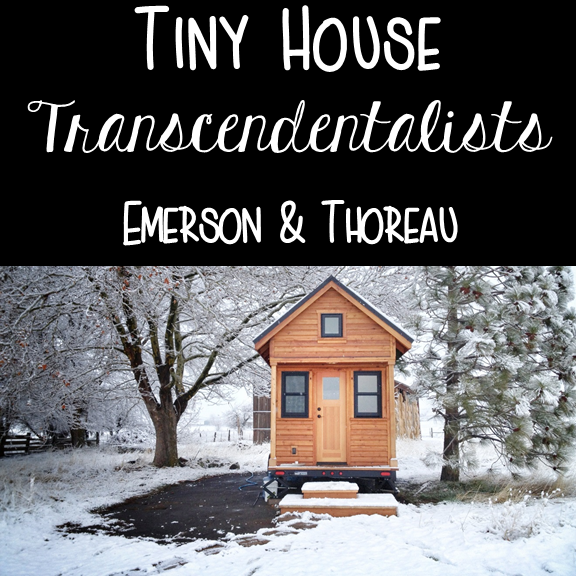 This past year, I designed a lesson that taps into the mindset behind the Tiny House Movement in comparison with the Transcendentalists. My students LOVED designing tiny houses for these literary legends and our discussions about consumerism ran deep. Around this same time, my husband and I started having our own conversations about what is really important in our lives and what experiences, rather than things, we would like to devote our money to. 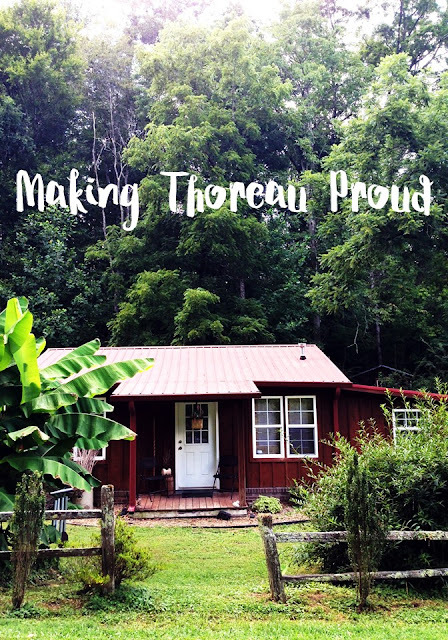 So in an unconventional act that I like to feel would make Thoreau proud, we downsized to a 700 square foot cabin by a creek in the woods. 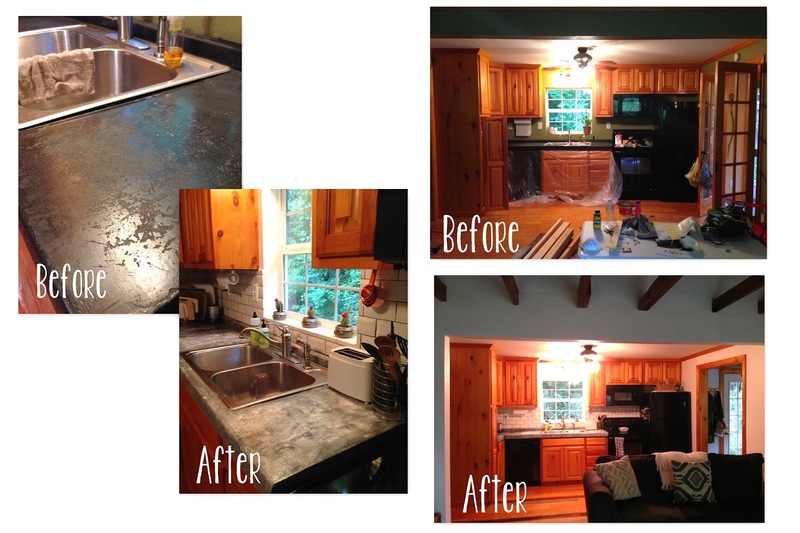 We also practiced self-reliance by remodeling it ourselves. Being two teachers, we definitely practiced our cooperative learning skills ;). I love how widening the doorway just a foot created so much of an impact. 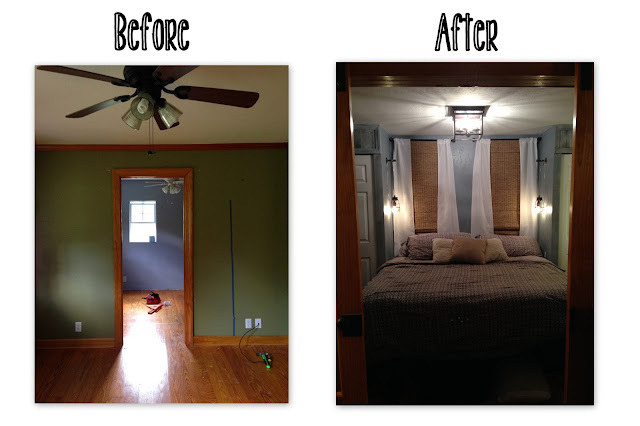 As you can tell from the before picture below, we reused the French doors from the kitchen by adding them to some barn door tracks. Our biggest change was in the bathroom. The original bathroom was well done, but it had a ton of wasted space (there was basically a hallway in the bathroom). 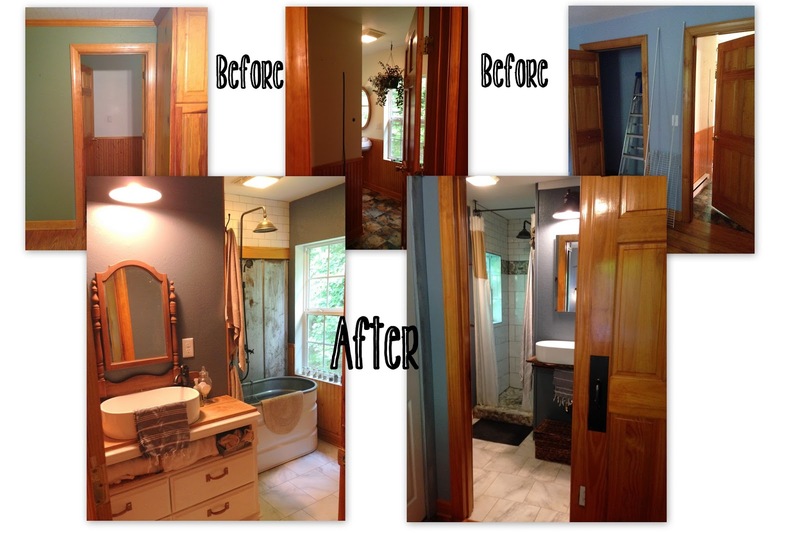 We reconfigured the closet and bath turning it into two bathrooms--master and guest. Our "master" bathroom is about 40 square feet. Ha! As you can see in the before, the bathroom had a double entry from the bedroom and from the kitchen. LOTs of wasted space. The after uses every inch! 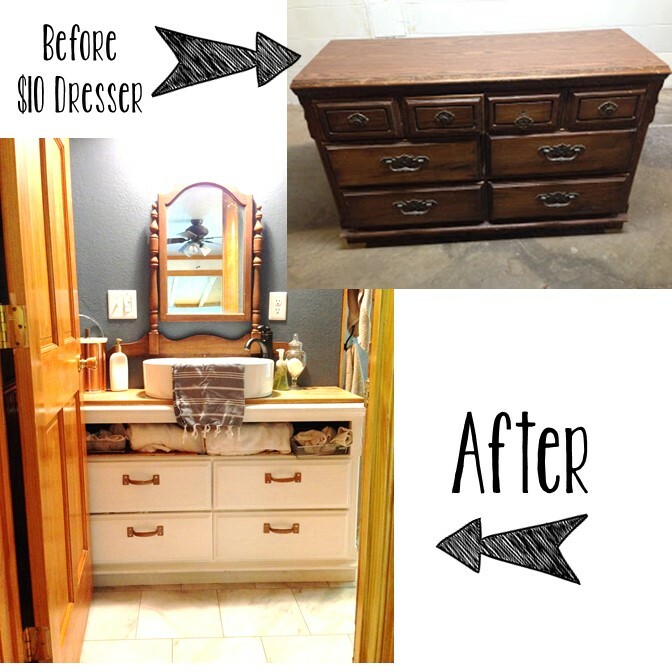 I found this dresser to redo at a yard sale for $10! Boom! This is the 4th vanity I've made. They are very easy to make if you use the sinks that set on top. It's honestly as simple as setting the sink on top, drawing a circle for the drain hole, and drilling through the wood. You do this for the faucet too. I will NEVER buy a real vanity. 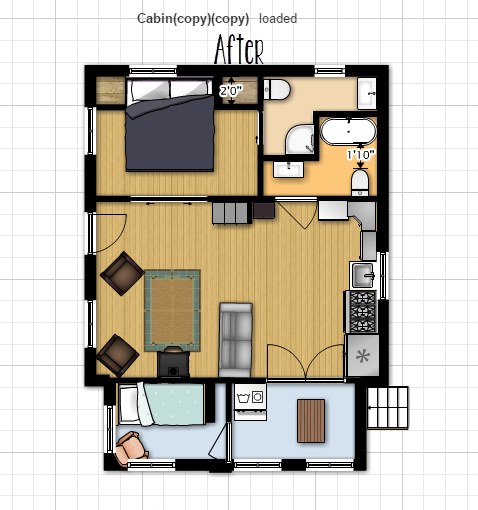 The markup for such a simple thing to build is ridiculous. I'm very proud to say that I did all of the tile work in our master bath myself. Now I can tell my students that you really can learn to do anything if you can read! One of the scariest things we did was have the ceiling removed in the living room. As you can see, it was a flat 8 foot ceiling. The sheetrock was removed, the roof beams were left in place, the wires were rerouted, insulation was added to the roof, and recycled barn tin was screwed in over the insulation. By the time we got to this project, we were both too exhausted to do it ourselves, so this ended up being the only thing we hired out (except for the rough in plumbing and electrical work of course). I tried to find information about this type of project on the internet, but there is none. Therefore, I'm going to be a good content provider and add pictures here of what it looks like to expose ceiling beams. It was scary and messy, but the end results were worth it. During the tearing out process. Please note ALL THOSE WIRES. I forgot to take a picture of the insulation, but it's in there! And I will leave you with my favorite reading spot house. This is the view from our bed **swoon**. I found this amazing propane fireplace on Craigslist for a STEAL at $300. Is it fall yet?? Awwww!!! Thank you!!! Listened to a Ted talk once that made the point that we spend most of our happiest times in tiny spaces--for example in tents and hotel rooms while on vacation (though I'm sure in your case it doesn't feel like vacation at all haha). Good luck to you at your new school! !